The debate as to whether dinosaurs were warm-blooded (endothermic) like mammals and birds or cold-blooded (ectotherms) like crocodiles and lizards, has taken a further twist with the publication of a study published in the journal “Nature Communications”. Scientists have used a new method to chemically analyse dinosaur eggshells which has helped them gauge the long extinct animal’s body temperature. Armed with this data and an estimate of the temperature of the surrounding environment, the researchers can postulate about whether dinosaurs had high metabolic rates and active life-styles or whether like alligators and lizards they tended to be only capable of short bursts of activity. The team’s findings suggest that dinosaurs were neither true endotherms or completely ectothermic, but somewhere in between – mesotherms. In addition, as two different types of dinosaur produced different results, this new study indicates that body temperature differed between dinosaur genera. Not warm-blooded or cold-blooded but somewhere in between. The conclusions drawn by the scientists are similar to those made by a team of American researchers who reported in 2014. Following an extensive analysis of the histology and ontogeny of fossilised bones (analysis of bone cells and growth) these scientists concluded that dinosaurs were probably mesotherms. The argument as to whether the Dinosauria were endothermic or ectothermic has raged for over 150 years. It was once thought that dinosaurs were slow-moving, sluggish, very lizard-like creatures. They had to bask in the sun or rely on other external sources of heat to help warm their bodies before they could become active. This meant that they were probably not very active at night, it also suggested that they had similar life-styles to extant reptiles such as crocodiles, snakes and lizards. These creatures can be very mobile, but only for short periods and they soon become tired. Thomas Henry Huxley (1825-1895), was one of the first scientists to challenge this view. He argued that birds and dinosaurs were closely related. In the 1960’s there was a revolution in thinking with regards to dinosaurs. John Ostrom’s work on the Theropod dinosaur Deinonychus led to dinosaurs being depicted as much more agile, fast-moving animals. Ostrom produced carefully argued and extremely detailed studies on dinosaur biology and anatomy and he depicted them as much more bird-like creatures capable of complex behaviour – more reminiscent of today’s mammals than like today’s reptiles. Robert Bakker (student of John Ostrom) championed the agile, active dinosaur theory. Robert Bakker, a student under the tutelage of Ostrom developed these ideas further and portrayed dinosaurs as warm-blooded creatures, it was Bakker who produced the famous illustration of Deinonychus shown above and it was Bakker who influenced a lot of thinking regarding the Dinosauria with his ground-breaking book “The Dinosaur Heresies”, which was published in 1986. The research team utilised a pioneering procedure which allows the internal temperature of female dinosaurs to be plotted by analysing the behaviour of two rare isotopes found in calcium carbonate, a key ingredient in eggshells. A total of nineteen dinosaur eggs were included in the study, they represent two very different types of dinosaur. Eggshells from Argentina came from a large Titanosaur (Sauropoda), the eggshells collected in the Gobi desert, Mongolia, represent fossils from a small Theropod dinosaur, an oviraptorid. The isotopes oxygen-18 and carbon-13 tend to cluster together at colder temperatures. The amount of clumping enabled the scientists to calculate the body temperature of the mother. Chemical analysis of the surrounding rock matrix permitted the researchers to estimate the temperature of the palaeoenvironment at around the time the eggs were laid. The analysis of these eggshells, all of which were collected from Upper Cretaceous strata, suggest that the Titanosaur’s body temperature had been around 38 degrees Celsius at the time of laying. This is a little higher than our own internal body temperature (37 degrees Celsius). The implication is that the Titanosaur had an internal body temperature similar to that of a endotherm, although it has to be considered that the huge gut of this giant herbivore, essentially an enormous, heat-producing digestive vat would probably have influenced the internal temperature. 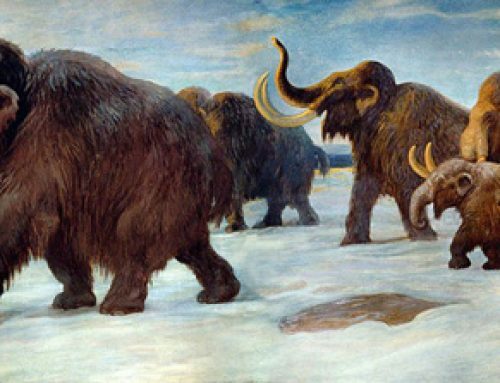 The sheer size of the animal, volume compared to surface area, would have probably helped it to maintain a relatively constant body temperature. Thermo-regulation for such large animals is not so much as trying to keep warm, heat loss from a large body is much less severe than with a small animal, for example. In the case of the Titanosaurs, once they warmed up they probably stayed warm for a very long time, keeping cool could have been more of a problem (that’s why African elephants have big ears). An example of Titanosaur fossil eggs (Hypselosaurus). The results from the much smaller oviraptorid paint a different picture. These dinosaurs were very closely related to birds, but the body temperature plotted is much lower than an endotherm. The scientists calculated that the Theropod had an internal temperature of around 32 degrees Celsius, but this was at least six degrees warmer than the environment. This suggests that oviraptorids, dinosaurs that were closely related to birds were able to raise their body temperatures above that of their surroundings. “The temperatures we measured suggest that at least some dinosaurs were not fully endotherms [warm-blooded] like modern birds. They may have been intermediate, somewhere between modern alligators and crocodiles and modern birds”. This study supports the idea that dinosaurs could produce heat internally and raise their body temperature higher than their surrounding environment, but they were unable to maintain this temperature at a consistent level like a mammal or a bird (endotherms). The scientists conclude that if the dinosaurs were mesothermic, they were probably more active than alligators but not as active as birds or mammals. The international research team state that they could not observe any strong evidence either for ectothermy or endothermy in the species examined. The body temperatures calculated for the Titanosaur and the oviraptorid indicate that variable thermoregulation likely existed among non-avian dinosaurs and that not all dinosaurs had body temperatures in the range of that seen in extant birds.